Residents Sue Chemical Maker Over Fires During Hurricane Harvey : Shots - Health News Some residents and first responders are suing the chemical company Arkema, saying it didn't do enough to protect them from fires that started at one of its plants near Houston after Hurricane Harvey. Shannan Wheeler says he suffered chemical injuries on his arms after a fire broke out at the Arkema chemical plant 3 miles from where he lives. He's now part of a lawsuit against the company. Shannan Wheeler was born and raised in Baytown, Texas, an industrial suburb east of Houston that is part of the so-called chemical coast. 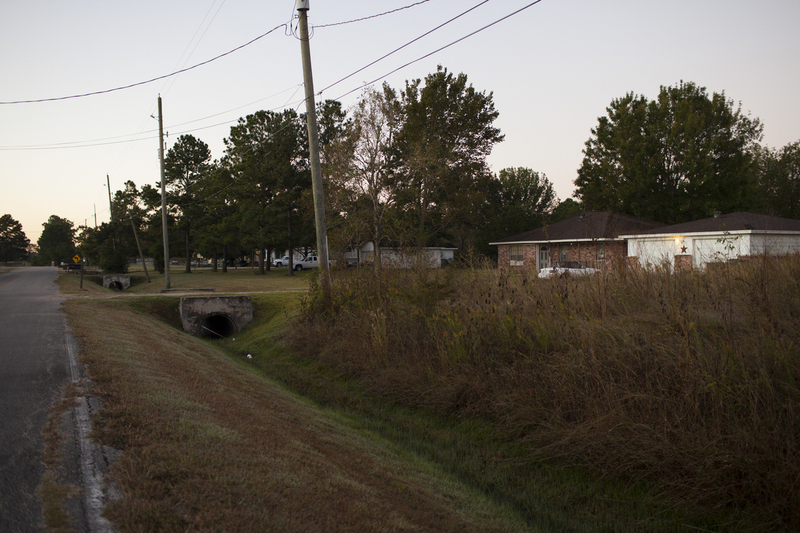 Houses are tucked between chemical storage tanks. Parks back up to refinery smokestacks. "I grew up around five of the biggest petrochemical facilities on the planet," Wheeler says. An uncle worked at Chevron. Another worked at Shell. "With my family's history I'm familiar with every one of them," he says. The Wheeler name is synonymous with business in the area. Shannan Wheeler's mother, Tracey, is the longtime president of the Baytown Chamber of Commerce, and he has spent his entire career as an engineer designing pipe systems for petrochemical facilities. So Shannan Wheeler, 52, is as surprised as anyone that he's part of a federal lawsuit against a chemical company, especially one that employs people in the town where he and his family live now. The lawsuit alleges Arkema, a chemical manufacturer, failed to protect nearby residents after its plant in Crosby, Texas, was flooded with 50 inches of rain during Hurricane Harvey, and chemicals caught fire. The suit alleges residents weren't warned about the danger posed by the resulting smoke. A company spokeswoman says Arkema rejects the claims that it failed to warn people about the danger from the smoke. The company also said it urged people to heed evacuation orders. The Arkema facility makes and stores organic peroxides, volatile chemicals used in plastic manufacturing, among other things. They need to be kept cool so they don't ignite. When water knocked out power to the plant, workers moved the organic peroxides to refrigerated trailers. But as the water continued to rise, plant workers were evacuated and the trailers flooded. The chemicals inside got warmer and warmer until they started to catch fire. Local emergency officials evacuated a zone with a 1.5 mile radius around the plant. Over the course of the next five days, nine trailers containing organic peroxides burned. People outside the evacuation zone wondered if they should be worried too. Smoke from the fires was visible for miles. Some residents worried the blazes might be putting dangerous chemicals into the air. At first, Wheeler wasn't concerned. 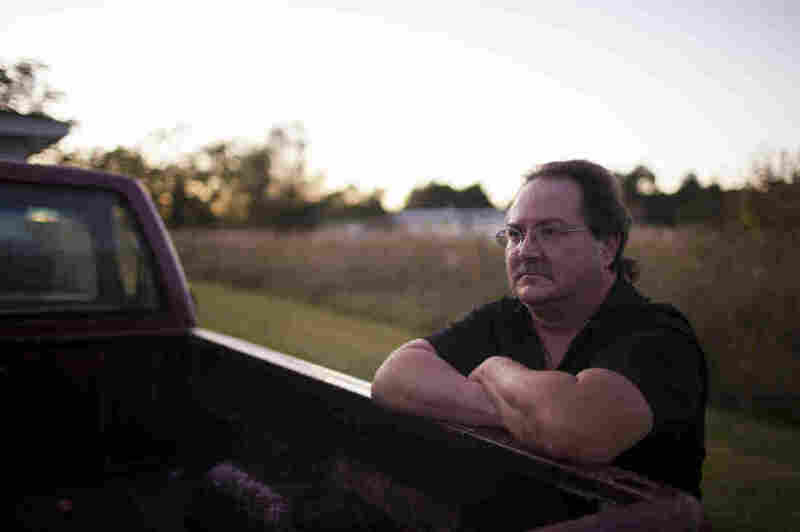 His home is more than 3 miles from the Arkema plant – double the evacuation distance — in a quiet part of town surrounded by sod farms. When the fires first started, he could see just the faintest wisp of smoke over the trees. "What I know from doing research is these things are going to catch on fire. They're going to burn with intensity. Most of the material is going to be consumed by very hot fire. From what I have researched and understand, the byproducts of that is going to be black smoke with carbon particles in it." Richard Rennard, an Arkema executive who spoke at press conferences for the company during the crisis, described the smoke as "noxious," adding "if you breathe in the smoke, it's going to irritate your lungs." He reiterated that the evacuation zone, with a radius of 1.5 miles, was sufficient. But neither he nor local emergency officials warned people outside the zone to take precautions, such as staying inside or turning off intakes on air conditioners. One of the pieces of ash that Shannan Wheeler found in his yard after the fires at the Arkema chemical plant. Wheeler first noticed the acrid smell the evening of Thursday, Aug. 31, after the fires began. "Usually in the evenings around here we get ground fog that comes it," he says. "It's really kind of pretty." But that evening the fog smelled like leaks he'd encountered working at petrochemical facilities. "The first smell I got was like battery acid," he said. He went inside his house, thinking something was wrong. When he went back outside a couple hours later the odor had changed to "something like bleach and ammonia." 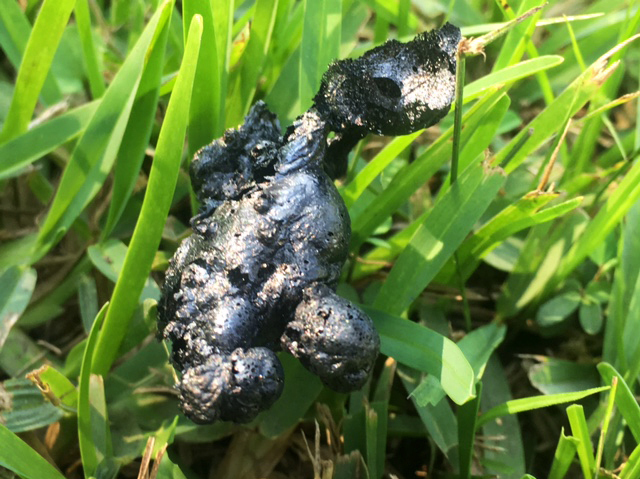 "Well, next morning came out and that's when we noticed these black oily splotches in this flower bed," Wheeler says, pointing at a strip of dirt just outside his front door. "They were bubbly and black, different from anything I've seen before. They looked like they collected where the dew was." On Friday, the same thing happened; the fog rolled in, bringing with it a smell like burning plastic. The dew deposited dark bubbly residue in his flower bed. He noticed pieces of black ash — some of it rounded like bubbles, some more like delicate sheets — lying in the grass. When he touched the ash with a screwdriver, it fell apart. "I called the [local police] emergency line and asked, but they didn't know anything. They were in the dark like we were," says Wheeler. Two days later, on a Sunday, Wheeler was at home watching the local news when he felt the house shake a little. "You could feel it. Like 'Boom!' And then a few minutes later another one." Arkema and emergency officials had decided to purposely ignite the six remaining containers of organic peroxides. A company statement said that it was the only way to be sure that the hazard posed by the unstable chemicals had "been fully eliminated." That day, "directly over those trees right there to the east, [I saw a] thick black column going up," Wheeler remembers. "And it was going pretty good. We watched it for about 10 minutes until it went up, and it got right under the cloud cover, and it rolled over. You could see it roll over like it hit a ceiling, and it spread." To Wheeler it seemed like the wind was carrying the smoke toward his house. From farther away, the column appeared to dissipate up and out in every direction. "All of the product has been successfully and safely burned," Arkema's Rennard said at a press conference after the controlled burn was over. "We have seen no evidence of any issues with [air quality monitoring] results." That night, there was no fog — and no odor — at the Wheeler house. A week later, Wheeler mowed his lawn for the first time since the fires. "I wear a respirator, for grass allergies, so I didn't notice anything while I was mowing," he says. After he was done, he picked up the grass clippings. "I was wearing gloves, and back behind the gauntlet of the glove, up on my wrist and everything, it was starting to sting a little bit, like I was in ants," he says. But there were no ants. Refrigerated trailers burned after floods knocked out power to the Arkema chemical plant in Crosby, Texas, and the organic peroxides stored inside the trailer ignited. The U.S. Chemical Safety Board is investigating the blazes. "Another four, five, six handfuls of grass and [I thought], 'This is bothering me!' I looked, and I noticed welts coming up along my wrists, down my thumbs, on both hands." "I've had enough training from my work that I thought, 'These look like chemical burns,' " Wheeler says. He yelled to his son to get baking soda and rubbed it on his wrists to ease the pain. The next day, he went to his doctor, who diagnosed it as dermatitis, or skin irritation, caused by chemical exposure, the complaint says. Organic peroxides like the ones that burned at the Arkema plant are known for being highly reactive. In fact, their reactivity is useful for manufacturing, because the chemicals help the building blocks of plastics assemble into long chains. But their reactivity also means organic peroxides have to be stored carefully. At the Arkema facility they were being stored as chilled liquids. After the power went out, the liquid heated up and caught fire. "These reactions produce a lot of heat," says Michelle Francl, an organic chemist and the director of chemistry graduate studies at Bryn Mawr college, who isn't involved in investigating the Arkema fires. The intense heat can be a good thing, because it means the peroxides burn completely. "When [organic peroxides] burn at the temperatures that they would burn at in this kind of fire, they turn into carbon dioxide and water. The peroxides turn out to be the easiest part of this whole thing." "This is carbon, hydrogen and oxygen," says William Carroll, an adjunct professor of chemistry at Indiana University who worked on organic peroxides for the chemical industry for more than 30 years. "There's nothing exotic in there. On the basis of what I know about this material, I would sincerely doubt that people a mile and half away were exposed to much in the way of organic peroxides." But it wasn't just the chemicals that burned, Arkema emission reports say. 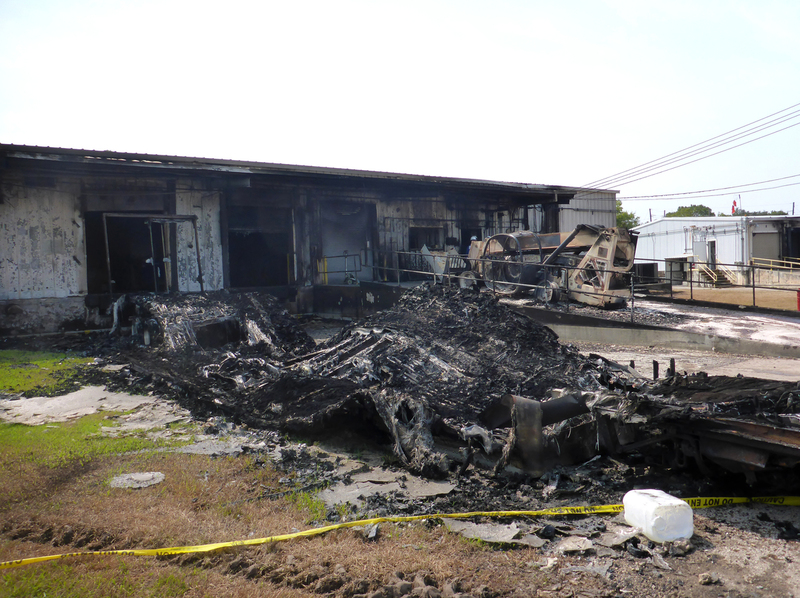 The vessels they were in and the refrigerated trailers where they were stored also burned. "A truck fire is ugly," says Carroll, who isn't involved in the investigations or lawsuits. "You've got wood, you've got metal. Burning a truck trailer is not something you want to do at a picnic." Photos released by the U.S. Chemical Safety Board, which is investigating the fires, show the remains of the refrigerated trailers. The metal is charred and twisted. The storage containers are no longer visible. The pavement is covered in thick, black, ashy residue. "Everything from the labels on things, to the whatever plastic or in some cases metal that the containers are made out of — all that stuff is not going to burn completely," says Francl. "It's going to turn into ash, and then it's going to absorb other chemicals that didn't burn entirely." The ash can travel through the air in tiny particles or in larger pieces. "I don't want to get rid of Arkema"
A week after the fires, Wheeler agreed to join a lawsuit against Arkema, alleging the company didn't do enough to protect residents from physical damage and damage to their property. In the complaint filed in U.S. District Court for the Southern District of Texas, he and 14 other plaintiffs describe rashes and respiratory problems they say were caused by chemical exposure. In the complaint, 0ne resident who walked through flood water near the factory describes "lesions and burns" on his legs. Another alleges he got sick from fumes after he was told not to evacuate his home, which is less than a tenth of a mile beyond the evacuation zone. A separate lawsuit by a group of first responders describes "police officers doubled over vomiting, unable to breathe" and alleges the cause was "toxic fumes" from the Arkema fires. "We deeply regret that anyone experienced temporary ill effects from this incident, particularly first responders who worked with us side-by-side to keep the public safe. However, we reject any suggestion that Arkema failed to warn of the danger of breathing smoke from the fires at the Crosby plant. Arkema officials urged the public, for their own safety, to respect the 1.5-mile evacuation zone imposed by the Unified Command well before any fire. It is also our understanding that those first responders who went to a hospital were released without being admitted to the hospital. Arkema will vigorously defend against any lawsuit we believe is mistaken in its claims." Wheeler now worries that the value of his property has been affected by the fire. She declined to comment further, citing ongoing litigation. There is also a criminal investigation by the Harris County District Attorney; a lawyer in charge of the probe confirmed one is underway but declined to give further details. The Environmental Protection Agency and Texas Commission on Environmental Quality are both investigating the fires. It will likely take months to analyze contamination at the Arkema plant, but there are some early indications about what chemicals were spread by the blazes. During the fires, the EPA flew a plane equipped with monitoring equipment through the plume, looking for evidence of unsafe levels of about a dozen chemicals, and reported "trace" amounts of peroxide and butane. "As with any fire, there was smoke," says EPA Acting Regional Administrator Sam Coleman, but "we did not see any of the constituents of concern at levels we considered unhealthy." Air emissions reports filed by Arkema list more than 65,000 pounds of chemicals as well as more than 17,000 pounds of particulate matter released as a result of Hurricane Harvey. Frankl says smoke and ash from any fire can cause problems. "It doesn't matter whether it was a chemical plant or not, the issues are real," she says. "People's lungs are irritated. There's a lot of unknown stuff floating around. Irritants can damage your lungs." The effects can be worse for babies or elderly people, or people who have asthma or other respiratory issues. Shannan Wheeler is quick to say he didn't join the lawsuit against Arkema to get money, and he's not even trying to hurt the company. "Running business and jobs and money out of town is completely foreign to me," he says. "So no, I don't want to get rid of Arkema." Instead, he says, it's about getting information about what happened, and holding the company accountable for what he refers to as "not being a good neighbor." "I need to know that my property is safe for me and my family and my dogs," he says. "Right now, I don't trust that I'm not going to be exposed to something on my own property in the future that came from that facility. And if this happens again – I mean, we live in a place that gets hurricanes – will things go better?" Wheeler says that his family history with the petrochemical industry is why he's suing the company, and not the local government, even though local emergency officials backed up almost every statement made by Arkema executives during the disaster. "They only knew what the company told them," he says. "I've worked for companies, I know what being a good neighbor looks like. They should have warned us. If they had told us to evacuate, I would have gone."